Calculations may be performed on multi-subunit proteins by separating sequences with an ampersand (&). The total mass of the sub-unit will be displayed including selected additions such as pyroglutamation, glycosylation and disulfide bonds. 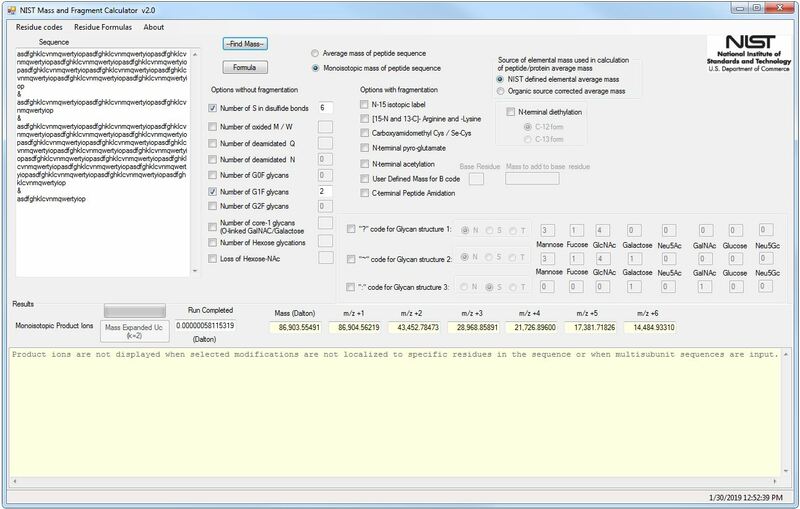 The Residue Codes menu option lists the valid single-letter codes for the residues including some modified residues. A useful feature is the ability to add a desired mass to a specific residue enabling the identification of fragment peak profiles which match experimental data. Version 2.0 includes the ability to obtain the expanded uncertainty (k=2) of the calculated result based on Monte Carlo simulation (100,000 trials) along with more modification options. NIST Mass and Fragment Calculator v.2.0 screenshot. This software was developed at the National Institute of Standards and Technology by employees of the Federal Government in the course of their official duties. Pursuant to title 17 Section 105 of the United States Code this software is not subject to copyright protection and is in the public domain. Each of these packages is an experimental system. NIST assumes no responsibility whatsoever for its use by other parties, and makes no guarantees, expressed or implied, about its quality, reliability, or any other characteristic. We would appreciate acknowledgement if the software is used; please cite Kilpatrick et al., Protein Purification and Expression 85 (2012) 94-99. This software can be redistributed and/or modified freely provided that any derivative works bear some notice that they are derived from it, and any modified versions bear some notice that they have been modified.